Mast Gully has high local significance as a place associated with an expedition to cut urgently needed ship's masts, from which the gully gained its name. In 1850 Captain John Freyer, master of the dismasted ship "Admiral", discovered a "forest of ship's masts" in the gully and cut several for his own ship. The gully has significance, too, for its associations with the bullockies Chaundy and Moore who brought out the first two 100-foot masts using 26 bullocks. The Mast Gully area also has historical significance as the site of an early 1850s timber camp, said to be the first in the Dandenongs, run by district pioneer splitters, Sandell and Fountain. A small section of the track into the Gully survives. There are also later associations with berry growers who lived in simple shacks beside the creek, harvesting wild and planted fruit. The property at 71 Mast Gully Road, and the adjoining public land along the higher areas of Mast Gully Creek retain some interesting evidence of the early land uses and activities in the area. The alignment of the track up Mast Gully once continued along the flatter land near the creek, rather than turning up the hill as it does now. 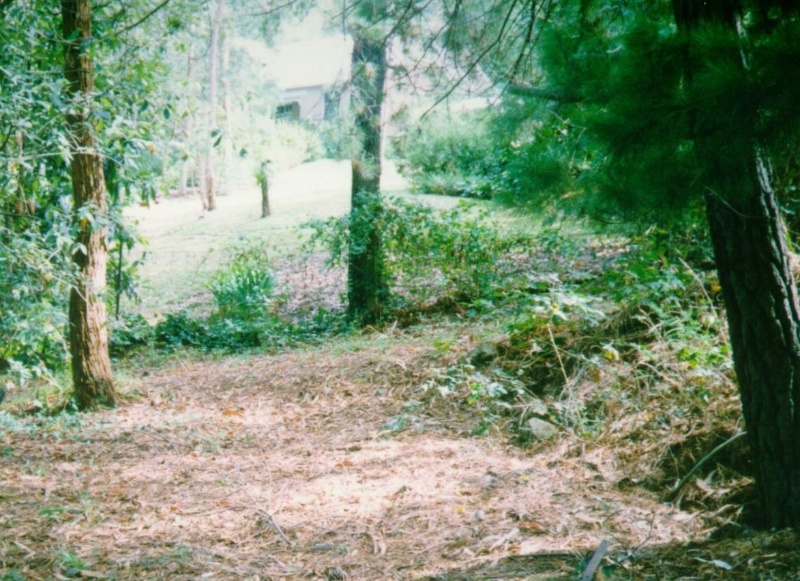 The alignment of this early track is probably followed fairly closely by the lower part of Mast Gully Road, but the only place in which its early form can be seen is within 71 Mast Gully Road, now known as Mast Gully Studio which has been run by historical artist Jack Montgomery for many years. The surviving section of the old track is quite small, probably 15 metres long and around 3.5 metres wide. Nearby is a large pine tree and a huge, ancient eucalypt. Between the current alignment of Mast Gully Road and this section of track is a large area of overburden, apparently dumped there as part of the road construction works some years ago. Jack Montgomery recalls the track from the 1960s when he moved to the area, and has included it in one of his paintings. A part of 71 Mast Gully Road was acquired by the Forest Commission some years ago. This land includes the site of one of the berry growers huts. Although nothing remains visible on the surface to mark this site, Jack Montgomery has collected several hand-made bricks that remained from the chimney. Another hut higher up the creek survived until it was destroyed in the 1960s bushfires.